I was lucky enough to travel to Tripp, South Dakota on March 12th 2014. They now have 9 families there, as they just got a new one recently. In talking with the Bishop he says the group was pretty well welcomed to the community. The only brouhaha mentioned by the Bishop was when one or two locals didn’t like the horse droppings left behind. Most people did not have any problem with it. I found the Bishop and his wife, and a couple other Amish families open and very nice. It would be fun to go back up sometime when I would have more time to spend (and when everything is green). This community was founded by Amish from the Tomah, Wisconsin community. One reason was a desire for more space. My guess, going by Tom’s photo, is that they found the space they were after. Hutchinson County is in the southeast corner of the state. 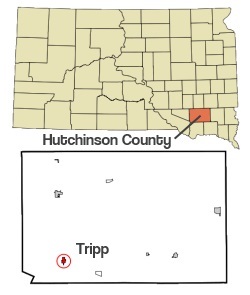 The nearest Amish settlement to Tripp is about an hour away, in northeastern Nebraska. This single South Dakota community is one of the more remote places Amish have settled. Like Amish in Texas, Montana, and other far-flung settlements, some just like it better off the beaten path. Hope that the community will increase. Best wishes to you and your community with Gods BLessing. Thanks for the information about this fairly new community. I’m going to add it to my list of Amish communities I’d like to visit. I, too, hope they prosper. I’d also like to see photos (should anyone go there) of it during the “green” part of the year. Is farming their main occupation (dairy or otherwise, being from Wisconsin)? How many people, total, live there now? It’s interesting to follow their progress, and good to hear another family has settled there. The Amish in Hutch. Co. SD have had an up and down existence. People come and people leave. They are finding SD not such an easy place to make a living. Hence the great exodus of “English” from SD. They started out in the dairy business but they were beset with problems so that has given way to raising bottle calves that are imported from out of state. This seems to be the main occupation among them. Several of the farms they have built up from nothing are standing vacant and for sale so anyone wishing to live in the midst of the Amish, you are welcome to buy a farm. Water is very hard to find in the area they’ve bought into so they are served by the rural water line in the area. Apparently their inhibitions to electricity as being unequally yoked with nonbelievers does not extend to the water pipe that they are also connected to non Amish with. The group appears to be a notch “higher” than the Schwartzentruber group in other ways. There’s not a high enough population in the area for many endeavors Amish tend to enter into to flourish. 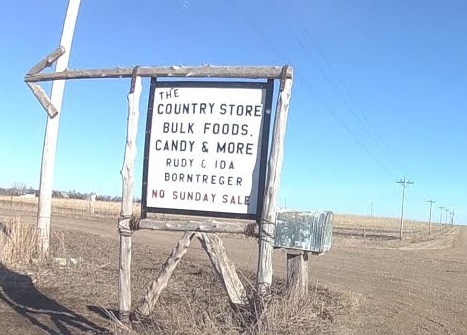 They have too much competition in vegetable raising, baked goods, and fresh chickens and eggs from the many Hutterite colonies in the area. The recent loss of several families is evidence of their struggles. Tom took a trip to Tripp. Thanks, Tom! An article titled, “Amish Furniture Tradition Alive In Tripp,” was written in Oct. 2013. Another article said that some of the local neighbors speak German. 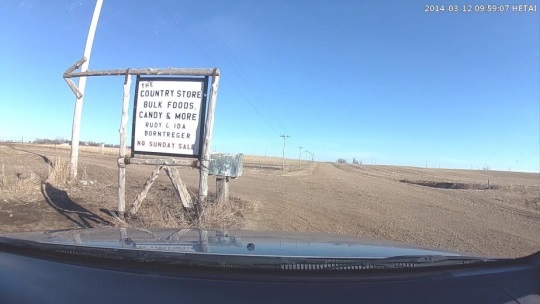 If you can forgive seeing a Pennsylvania gray buggy at the beginning and end of the 3:43 video, an article from 2010, “The Simple Life,” is about the Tripp, SD Amish. Great resources Linda, thanks! Tom has also sent me a few more photos from his visit which I’ll be getting up here in an upcoming post. Thanks for sharing the photos. It’s nice to see green in the fields and trees leafed out. The photos with the original post made the area look so barren…now I can understand the attraction for moving there for more space. The area is barren compared to other places Amish have settled. About six years ago they didn’t get any crops at all. South Dakota is not a land of luxurious green but a couple months out of the year.